Here’s the problem: web video is beginning to rival television, but there isn’t a good open resource for subtitling. Here’s our mission: we’re trying to make captioning, subtitling, and translating video publicly accessible in a way that’s free and open, just like the Web. 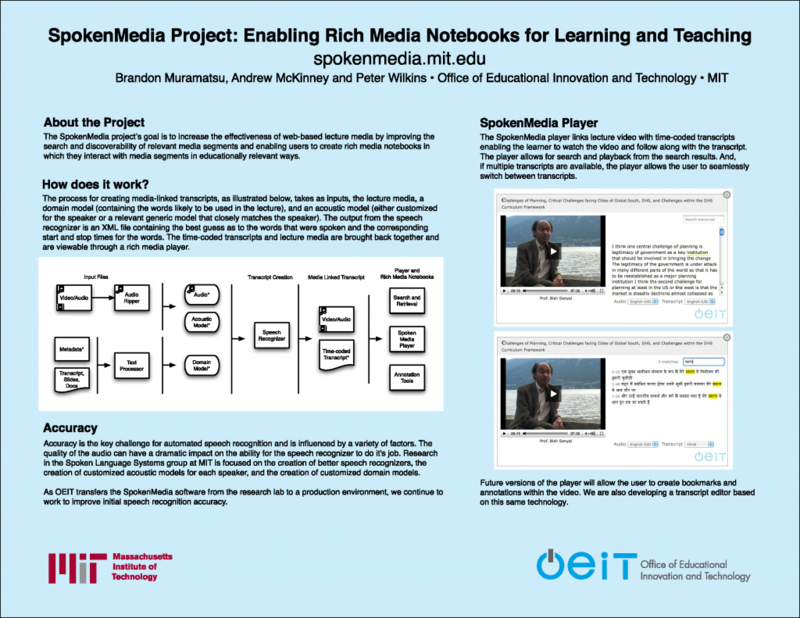 The SpokenMedia project was born out of the research into automatic lecture transcription from the Spoken Language Systems group at MIT. Our approach has been two fold. We have been focusing on working with researchers to improve the automatic creation of transcripts–to enable search, and perhaps accessible captions. We’ve been working hard with researchers and doing what we can do from a process standpoint to improve accuracy. We have also been working on tools to address accuracy from a human editing perspective. In this approach we would provide these tools to lecture video publishers, but have considered setup a process to enable crowdsourced editing. Recently we learned of a new project, Universal Subtitles (now Amara) and their Mozilla design challenge for Collaborative Subtitles. Both (?) projects/approaches are interesting and we’ll be keeping our eye on their progress. (Similarly with UToronto’s OpenCaps project that’s part of the Opencast Matterhorn suite). Here’s a screenshot from the Universal Subtitle project. 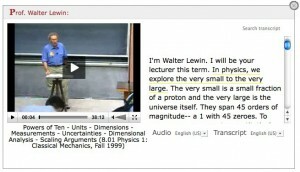 Here’s a screenshot of the caption widget from the Collaborative Subtitling project. In a recent email from the Opencast community, I received a link to a post titled, “HTML5 video Libraries, Toolkits and Players” that gathers some of the currently available info on HTML5 Video. HTML5 Video is something that the SpokenMedia project will begin investigating “soon”. The protocol conforms to WC3’s proposed Timed Text Markup Language (TTML) 1.0 specification. We selected this specification because our primary data is time-aligned text and this specification is a standard used by our collaborators. YouTube announced in early March that they would be extending their pilot program to enable auto-captioning for all channels. Captions will initially only be available for English videos. Auto-captions aren’t perfect, the owner will need to check that they’re accurate. Auto-captions will be available for all channels. We think this is great, if YouTube can automatically caption files, at scale and with high accuracy, that’s a great step forward for all videos, and definitely the lecture videos that we’ve been interested in the SpokenMedia project. Though, as with SpokenMedia’s approach that builds on Jim Glass’ Spoken Language Systems research, they still have a ways to go on accuracy. SpokenMedia will provide an editor to improve the accuracy of the transcripts. In any event, if you’ve watched the recent slidecasts of the last couple SpokenMedia presentations, you’ll see that we’ve included the impact of Auto-Captions on SpokenMedia. Low and high accuracy editors–We believe the best approach to transcript editing involves separating the editing into two distinct phases. In cases where the transcript is mostly accurate, we want to retain the time/word relationships. That is, for every word, we want to make sure we retain the timecode associated with that word. In cases where the transcript is mostly inaccurate, we believe it’s best to just edit the transcript as a single block of text. And that we’ll take the edited transcript and align it to the audio after the transcript editing is completed. Unfortunately, this will require a time delay (best case is about 1:1.5) to reprocess the video. Be simple and intuitive to use. Support the user with a limited amount of extra mousing and/or clicking (this is the one compelling reason for us to have the “low” and “high” accuracy editors). Integrate an audio/video player within the UI of the transcript editor (instead of running the video/audio as a separate application, or in a separate window, from the editor). 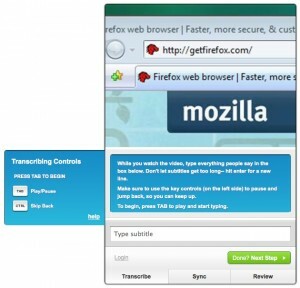 An editing communication protocol to be implemented between the server and client browser. We’ve seen some initial designs from Ryan, and once we have this design phase completed, we’ll post the editors with transcripts and go into a testing phase.